Often times, it isn’t until we are injured and in physical therapy, that we start giving the proper attention to the smaller, less glamorous muscles in the body. The stabilizer muscles that keep our joints secure during physical activity. We spend so much attention on the big exercises that have aesthetic reward, and forget about the muscles that allow us to do those exercises correctly. If we are proactive about strengthening those muscles regularly, we can avoid common injuries, and our bodies will be very thankful. The body is one big kinetic chain, and when one link in that chain is weak or unstable, it affects everything above or below it. So when your knee is consistently hurting every time you run, there is a good chance it’s not the knee itself that is the problem, but rather the lack of stabilization at the hip above it. If the hip joint is not stable, every time the foot makes contact with the ground during running, the knee and ankle (and even the spine) will endure a greater degree of the stress. Repetition of this stress can eventually lead to injury. The same thing goes for the shoulder. Like the hip, the shoulder, or humeral joint, is a ball-and-socket joint, and has more range of motion than any joint in the body. Because of its freedom to move in all directions, its stability is crucial for optimal functioning throughout the rest of the body. Muscles of the neck and back will overcompensate during upper body movements, such as the bench press exercise or pull-up, if the humerus isn’t stable. In fact, the musculoskeletal system is so connected, that instability at the shoulder, can cause a sprain of the ankle. Place an exercise mini band around the ankles (you can also place it around the feet, anywhere between the knees and ankles, or right above the knees). With a slight bend in the knees, and a slight hinge at the hips, step laterally to one side for the prescribed amount of reps. Keep the knees directly over the ankles to avoid the knees caving inwards (knee valgus). Focus on the gluteus medius’ doing the work (outer part of hip). In a supine position, bend one knee and place the foot of that leg on a BOSU ball. Keep the other leg straight up in the air. Extend the hips upward by engaging the gluteus maximus muscle of the leg that’s foot is on the BOSU. Slowly lower to the ground and repeat for the prescribed amount of reps. Lying on your side, stack both legs on top of each other, and bend the knees about 45 degrees. The bottom leg stays stationery on the floor. Keeping the foot of the top leg against the foot of the bottom leg, lift the knee of the top leg as high as you can without rotating the trunk. Slowly lower back down and repeat for the prescribed amount of reps. Focus on the gluteus medius’ doing the work (outer part of hip). Lying on your side, stack both legs on top of each other, and bend the knees about 45 degrees. Keep the bottom arm comfortable extended on the floor, and place a dumbbell in the hand of the top arm. With a 90 degree bend on the elbow, external rotate the arm as high as it can without rotating the trunk or hips. Slowly lower back down and repeat for the prescribed amount of reps. Stand with the feet shoulder width apart. With a dumbbell in each hand right outside the hips, slowly raise the arms diagonally to form a “y”. 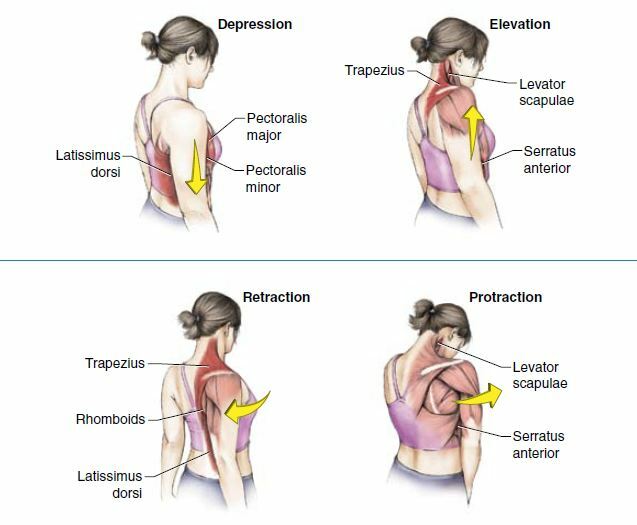 When you reach the height of the shoulders, slowly lower back to the starting position and repeat for the prescribed amount of reps. Keep the shoulder blades squeezed together and retracted and depressed for the entire range of motion. Come into a prone position, either on the floor, a bench, or a physioball. For all three movements, keep the shoulder blades squeezed together and retracted and depressed for the entire range of motion. Think about using the postural muscles in between the shoulder blades to help raise and lower the arms.